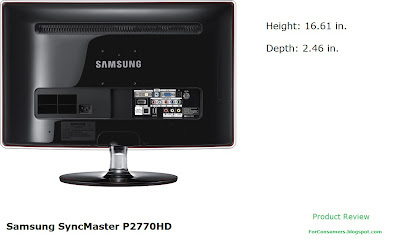 Samsung SyncMaster P2770HD review - today at For consumers blog we are going to review one of the affordable HDTV and monitor combos which can be find for as low as $250. This is a very good price for a monitor of this size but lets see if the Samsung P2770HD will be up to the job. Its features and specs are definitely not cutting edge technology but the 1920x1080p resolution and 300 cd/m² brightness show that this product is not only cheap but also a very capable one. 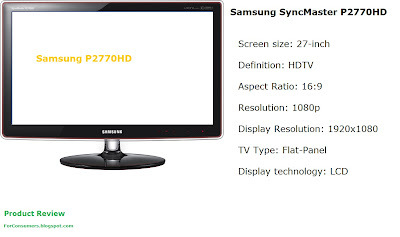 Samsung P2770HD LCD TV delivers crystal clear picture quality with 50000:1 dynamic contrast ratio. The 27-inch screen size is just perfect for kitchen or smaller rooms or in case you want only one device, combining TV and PC monitor in one. That is of course possible thanks to the Samsung P2770HD. It also comes with 3W stereo speakers fully operating remote control. Green might very well be the most important pigmentation in Samsung's Touch of Color innovation. That's because behind its subtle, sophisticated appearance and energy efficient design looms a forward - thinking engineering effort that ensures that its manufacture is environmentally friendly. This monitor is lead -, mercury -, Freon - and VOC-free and no volatile organic compounds have been emitted during its manufacture. On top of that, its exterior is 100% recyclable. Enhance your work environment while protecting the Earth's environment. Look to your right, then left. If gadgets, sidebars and movies feel clipped or crammed, you need a wider monitor. Like the 70 series monitor. It's wide enough to pull up two Internet screens side by side. With excellent viewing angles, your eyes will move more easily across the screen. And with more space you can enjoy what's there instead of wondering where it went. You'll want to take a second look at Samsung's 70 series monitor. At 1920 x 1080 it delivers breathtakingly vivid HD on a wide screen. There's so much photorealistic detail that every time you watch something on it, you'll feel like you're seeing it for the very first time. The only time you'll see an image stretched or distorted on the screen of 70 series monitor is when the director wants you to. 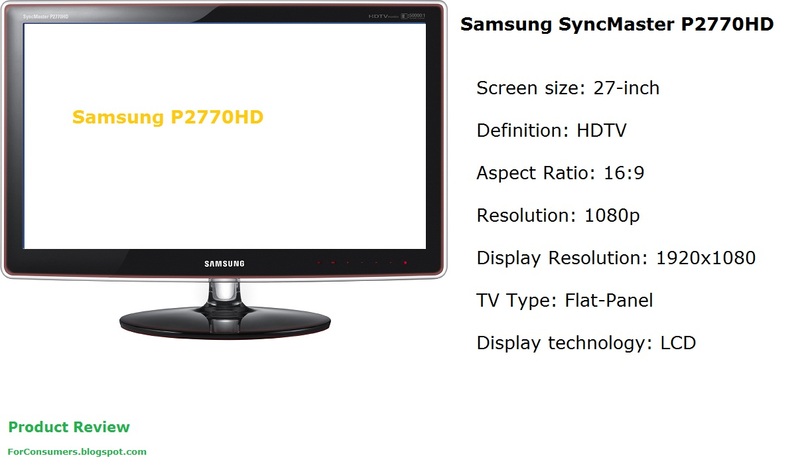 The series monitor has been optimized for Full HD sources. So what you'll see is as perfect as a home theater, a 16:9 ratio. In other words, the way your games and movies were meant to be seen. Samsung's HDMI (or High Definition Multimedia Interface) connections are the fastest, most secure way of connecting peripheral high definition devices with your monitor. Everything from DVD players to camcorders and video game consoles to digital cameras connect with ease, and are the most pure digital output you'll experience.